Flying is still fun. If I’m travelling by plane adventure awaits. Still, the thrill of airline travel wanes on a 24-plus hour journey from Australia to Europe. Or even an eight hour flight to Asia. Although I appreciate the luxury of flying and the enforced excuse to doing nothing except write, watch movies and eat, being squished in a small seat with no privacy or personal space grates. Like running a Half Marathon, flying long haul is an endurance test. Generally, I avoid budget airlines because flying’s tough enough anyway. I’m reluctant to downsize to an even smaller seat with no food or movies and, quite likely, a long stopover somewhere I’d rather not be. I usually pay more for direct flights with airlines that are household names. However, that makes overseas travel for our family of five limited. Flying is often the most expensive part of travel and buying five overseas tickets is a significant investment. Flying free sounds good but amassing enough airline points can take forever. So, when I was invited to fly with budget airline Scoot, I was keen to see what it would be like but apprehensive. I’m becoming a bit of a softie in my old age and I did not want to endure a painful journey. Happily I didn’t have to; if flying Scoot had been a bad experience I would not be writing about it here. My policy as a travel blogger is only to write about things I would recommend to others. I was a guest of Scoot during my trip to Asia but am under no obligation to write about the experience. I’m choosing to because flying Scoot has so many benefits it would be amiss for me not to cover them here, especially if it helps you travel more. With that caveat aside, here are five reasons to fly Scoot. Scoot currently flies from Australia to the most popular destinations in Asia and will expand its service with flights to Europe next year. It’s hard to be specific as flight prices vary depending on the season, but Scoot’s prices tend to cost less than half what other major airlines charge. Those savings mount up when you’re buying tickets for the whole family. For example, five return flights to Singapore with a full service airline might cost up to AU$5,000. With Scoot the price for five return tickets could be as low as AU$2,000. That’s a huge saving which could make an overseas family holiday that once seemed impossible, possible. If your personal comfort is more important than price (see also what to wear on a long haul flight) then you can fly Scoot business class for about the same price as an economy seat on full service airlines. You still have to pay extra for things like food, drinks, blankets and eye masks, and no one will hand you a free pair of pyjamas or a designer label wash bag stuffed with products. But you will get a business class-sized seat with a reasonable recline so you can actually feel comfortable and even get some shut eye. Business class passengers also enjoy complimentary perks such as welcome drinks, ScootTV, in seat power to charge your gadgets and 30kg checked baggage. 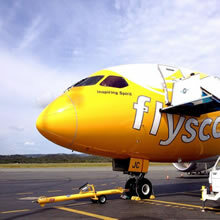 Scoot is owned and operated by Singapore Airlines which has an excellent reputation for safety and reliablility. Our flights all left bang on time and we flew in a spanking new Boeing 787 Dreamliner plane. Oh, and despite previous poor experiences with bathrooms on planes and worst fellow passengers on a plane, no problems presented themselves there! On a long haul flight from Australia to Europe, Singpore is my favourite place to stopover, either for a pitstop at the airport or a longer stay. Singapore’s clean, safe, easy to travel round and fun. The food is fantastic and the entertainment options are endless, from wandering round little India and picking up a sensational curry to splashing out on a meal and Singapore Sling at iconic Raffles Hotel where I spent my stopover! You can even join a free Singapore Tour from the airport if your stopever is six to eight hours and see the sights with no effort or cost. Food and entertainment aren’t the main drawcard on Scoot but, for a small additional charge, you will be fed and entertained. Food: You can choose from a small selection of reasonably prices snacks or hot meals. These are best booked before you fly. I enjoyed the dry laksa which was pleasantly spicey and perfect for carbo-loading before a big run! Entertainment: You can pay extra for ScootTV. There are a few movies to choose from which can be streamed onto your device and there’s a paid WiFi service so you can work or play online. After a misspent youth travelling on the cheap by donkey cart, fire truck or whatever stopped to pick up this gangly foreign hitchihiker, I’m now a princess when it comes to travel. The idea of flying with a budget airline did not appeal so flying Scoot pushed me out of my comfort zone. Hapily those fears were overcome. Flying Scoot was fine, especially up front in business class, and I’m open to flying economy if it will help us save enough money to take the family overseas more often. If you want to travel more but the cost of flights is holding you back try Scoot. Get free email updates from Get In the Hot Spot with weekly tips to help you be more adventurous and have more fun. Sounds good? Click here now. Ah good to read, flying on my own feels so cheap these days because it’s SO wildly expensive to fly with the whole family. I’m dreaming of an Asian escape so will keep an eye on Scoot prices. Did 10 hours overnight on China Air to Taiwan and that was absolutely fine… the thrill of travel means who cares if you don’t get a good nights’s sleep?? And next time alone with no kids, will definitely look at Scoot business – wouldn’t have thought of that but it makes good sense. How good would it be to fly Scoot business with the kids in economy ;) But really, whatever helps us travel more has got to be a good thing! Seems like a nice enough budget option … I’ll have to try it soon! Super helpful thanks! I’ve been tossing up whether to fly them or not. It’s good to know all the positives and your experience. Glad to hear I’m not the only ‘princess’ out there when it comes to flying!! I’ve avoided flying with low-cost carriers so far and now that our kids have grown up and left home, thankfully we only have to fund two airfares when we travel overseas. Having said that, I would consider flying with Scoot to Europe – their advertised fares for their inaugural flights to Athens looked amazingly good. Business class for the price of economy? Yes, please!